The pictures here are my latest hand bound books embellished with glass mosaics I created. For me, this is a full circle relationship with books. When I first faced the necessity to tear up an old book to use the pages in my collages it was: “Wow, I just cannot do this!” Tearing books is still very unsettling experience for me, rooted way back in my childhood. In Russia, from my beginning of personal awareness of books and the beauty of the written word, we were taught, “Love Books…They are the source of knowledge.” I loved the written word and remember my parent’s huge oak dining table that doubled as my supervised homework desk. I would sit at the table doing my homework but I had worked out a plan that used a pull out board under the table that held my copy of “The Three Musketeers,” a wonderfully engrossing piece of fiction so much more interesting than 8th grade chemistry. My parents were earnest and very involved in my homework focus so it was my earnest and secret agenda to blend my personal reading with that homework. I was finally caught finishing my book under a blanket with a flashlight. The bottom line was that all books were precious to me. We were taught as children to protect and take care of books and in exchange for that care, we travelled in time and space sharing life experience of countless authors. A secondary result is a deeply ingrained reverence for the physical protection of books. As mentioned before, I was aware of my deep seated uneasiness relating to the destruction of books to create a new piece of artistic expression. However, now I’m feeling more comfortable as I’m able to compensate the damage by making new books. I mentioned all of this to Russ. Russ has his own history which although located in rural Wisconsin, had parallel experiences that developed his own reverence for books. To this day, Russ can not turn down a page corner of a book and he “breaks in” new books in a procedure taught to him in grammar school. Today, Russ gave me the greatest endorsement by giving me from his precious book collection, a pair of hand bound National Geographic compilations produced in the 1920’s to use anyway I see fit in repurposing these items into new art. Lovely post, Elena. I eagerly await your National Geographic creation! I love your story Elena. It reminds me so much of the way I was raised. When I was able to buy my own books, I realized I would be able to underline sentences in pencil. My favorite parts that I'd want to be able to find again, easily. Even knowing that, it took a very long time to put that pencil to that first page. I CAN feel how you felt. But I also feel that it is your deep love of books that is leading you on this creative journey. Your work shows this. The two books above are beautiful. The mosaics are joyous. 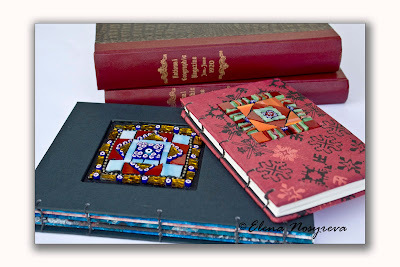 And I found a special surprise when I enlarged your image to be able to truly enjoy the mosaic work...The outside border on the pink/red book - the mosaics look like lines of books!!! How perfect!!! And a round of applause for Russ - he knows! Sharon, on behalf of Elena and I, thank you for your comment. Clearly you are a kindred spirit and no doubt our journeys & journals will intersect again. You will find humorous that Elena commented this morning that she just can't cut into the bound National Geographics. Oh Russ, I understand what Elena is going through! First, a deep love of books and now, knowing how much you've cherished these bound National Geo's - just too overwhelming. Maybe she can start with a "non invasive" first step, scanning and printing some of her favorite finds first. Taking these pages in any direction she feels necessary, free to do whatever, realizing the source is still whole. She may either find the magic here or a clear understanding that it is the source that beckons. Good Luck!